When an app crashes, it disrupts the user experience, may cause data loss, and worst of all, might even cause users to uninstall the app altogether. As developers, we do our best to minimize crashes, but no app is ever perfectly stable. A crash can actually represent a great opportunity to improve an app and one of the best things we can do as developers is to measure our crashes and exceptions. 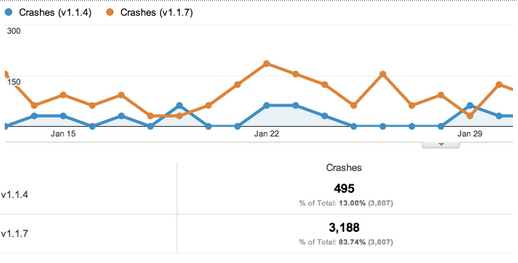 The crashes and exceptions report in Google Mobile App Analytics. Measuring crashes in your app can help you make better a product, make more money (if that’s your thing), and use your development resources more efficiently (especially if you are the only developer). Google Mobile App Analytics offers easy-to-implement automated crash and exception measurement for Android and iOS as part of the V2 SDKs, as well as a host of reporting options to slice the data in context with all of the user engagement, goal completion, and in-app payments data you already know and love. 1. Automate your crash measurement. Implement automated crash measurement with just one line of code on Android or iOS. Now each time your app crashes, the crash will be measured and sent to Google Analytics automatically. Try automated crash measurement now for Android or iOS. 2. Find out how stability is trending. Are new releases increasing or reducing app crashes? Monitor the stability of your app from version to version by looking at crashes and exceptions by app version in the Crashes & Exceptions report. If you are measuring the same app on two different platforms, like Android or iOS, you can break this view down further by selecting Platform as the secondary dimension. View crashes and exceptions by app version number in the Crashes & Exceptions report. In this example, version 1.1.7 has crashed 7,285 times, while the latest version 2.0.0 has only crashed 91 times in the same period. Nice work dev team! To graph crashes for two or more versions over time, you can create advanced segments for each version number, and apply them both to the Crashes and Exceptions report. See crashes by app version over time using advanced segments and the crash and exception report In this example, a bug fix pushed around January 24 caused significant reduction in crashes across both versions, but crashes persist for v1.1.7 that might warrant some additional investigation. 3. Find out what crashes are costing you. Do you know what app crashes are costing you? Find out what crashes cost in terms of both user engagement and dollars by using a custom segment. By using a particular crash or exception as a custom segment, you can see how user engagement and in-app revenue may be impacted by a particular issue or set of issues. Use custom segments to segment user experience and outcome data by crashes. This gives you some idea of what they might be costing you in users and in dollars. To set this up, you’ll want to create two custom segments: one that contains all the sessions in which the exception(s) occurred, and another baseline segment that contains all other sessions unaffected by the exception(s). Learn how to create advanced segments. Once created, try applying both segments to your Goals or Ecommerce Overview reports to get a sense of how the exception(s) might affect user outcomes. Or, apply the segments to your Engagement overview report to see how the exception(s) might impact user engagement metrics. 4. Gain visibility into crashes at the device model level. Do you know which device models are the most and least stable for your app? Developers can’t always test their app on all devices before launch. However, by using Custom Reports in Google Mobile App Analytics, you can monitor crashes and exception per device to find out where additional testing and bug fixes may be needed. To see crashes and exceptions by device, create a custom report and use a dimension like Mobile Device Marketing Name, with Crashes and Exceptions as the metric. Learn how to create a custom report. See crashes by device by using a custom report. 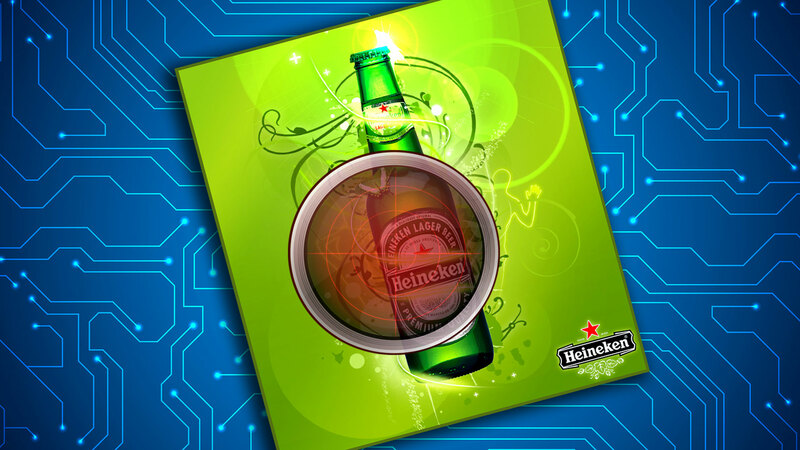 To get even more detail, add the Exception Description dimension as a secondary dimension. In this example, the high level view shows the Galaxy Note and Desire HD as device that might need additional testing before the next launch. 5. (Advanced) What about caught exceptions? You should measure those too. While caught exceptions won’t crash your app, they still may be valuable events to measure, especially when they might have an impact on user experience and outcomes. For instance, if your app normally catches a server timeout exception when requesting user data, it might be useful to measure that caught exception to know how often a user’s request is not being fulfilled. A caught exception is measured in Google Analytics using a custom description. In this example, a number of failed connections may indicate a backend problem and could be causing a poor user experience. Reducing the number of these caught exceptions could be a goal for the dev team in the next release. Get started measuring caught exceptions on Android or iOS. As always, please keep in mind that you should never send personally identifiable data (PII) to Google Analytics. Raw exception descriptions may contain PII and we don’t recommend sending them to Google Analytics for that reason. Also note that there’s a 100 character limit on exception descriptions, so if you send your own descriptions, be sure to keep them concise. People are constantly connected and searching from all kinds of devices. Advertisers are looking for ways to quickly provide customers with the right information, in formats that make sense for where they are, the time of day, and the device they’re using. As part of AdWords enhanced campaigns, we upgraded call extensions and sitelinks with several new features to help you reach customers in more relevant ways across these varying contexts. In this post and a Learn with Google Webinar this Thursday, February 28th, at 10am PST (sign-up here), we’ll provide a closer look at these new features, and give you practical examples for how to use them to drive better business results. Many advertisers customize their ad content to align with their business hours or special events like sales and promotions. With enhanced campaigns, you can now schedule the specific dates, days of the week, or times of day for your call extensions and sitelinks, at either the ad group or campaign levels. So instead of having to manually turn ads on or off to run specific extensions, you can now schedule them ahead of time. Example: A multi-national sporting goods business has a website and physical stores in 5 major cities. With enhanced campaigns, Mary, their online marketing manager, can align her AdWords schedule with the operations of the business. Mary runs call extensions between 10am and 6pm when her stores are staffed. After 6pm, she schedules ads to point to the website instead of the call extension. For weekend sales and promotions, she can schedule sitelinks pointing customers directly to her “Sale” page. 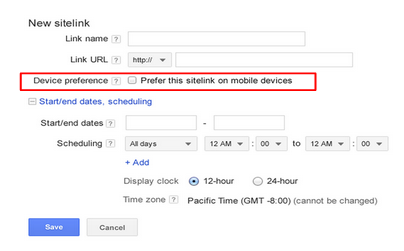 Scheduling enables sitelinks to appear exactly at the times that Mary sets (e.g., 12 midnight on Saturday) instead of having to manually turn them on at that time. Many advertisers drive leads or conduct business over the phone, so they value phone calls as much as, or more than, clicks to their website. To give you greater visibility into the full value of your ad spend, AdWords reports now count phone calls as conversions, making it easier to compare calls alongside more traditional conversion types like online sales. 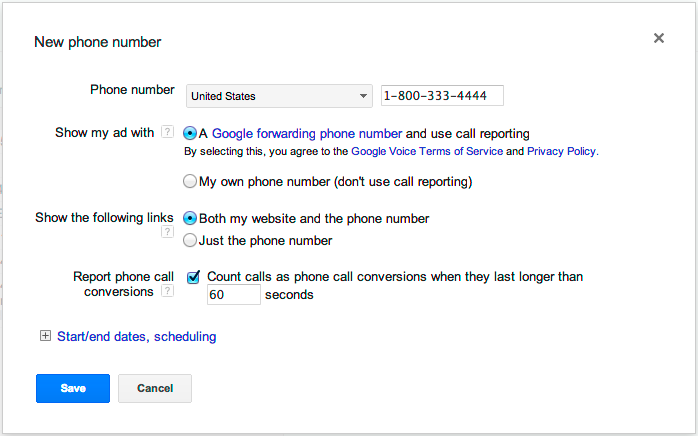 For example, you can now specify that calls longer than 60 seconds count as conversions. We’ve also made reporting for individual sitelinks more precise and actionable. 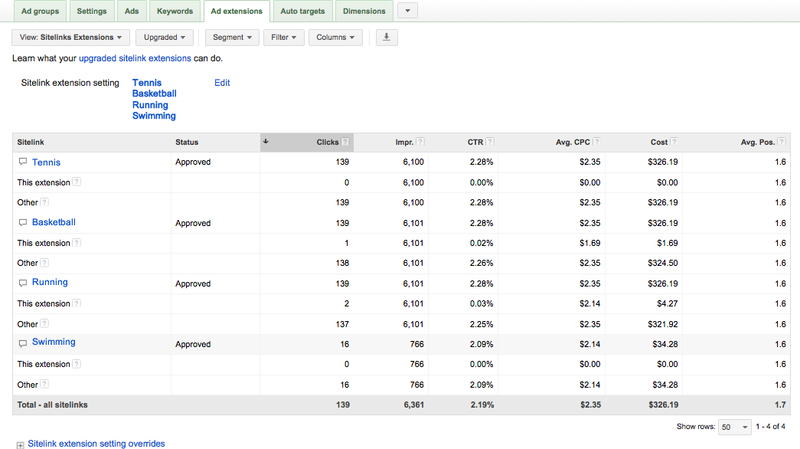 You can now manage and track sitelinks individually to ensure that each one drives the right ROI. You can also take advantage of per-link approvals so if one link is disapproved, your other links can still run. Mary further segments her data with the “This Extension vs. Other” feature. Here, you can see that two clicks occurred specifically on the “Running” sitelink while 137 clicks occurred on the other parts of the sitelink, like the headline. We really value your feedback to help us make AdWords even better. In fact, many of the new features that we described today are a result of your ideas and suggestions. Please continue to share your thoughts using this form so we can continue to improve the product. Google Analytics excels at collecting an incredible amount of information about how visitors interact with the web and mobile properties of its users. This data provides marketers and analysts who know what they’re looking for with with an incredibly powerful platform to understand what’s working and what’s not. To those who aren’t sure what they’re looking for though, all of this information can be overwhelming and make it easy to take no action at all. SiteApps enables businesses to get instantaneous, free recommendations on how to optimize their website based on their Google Analytics data. SiteApps’ technology runs hundreds of automated analyses on its customers’ web data to identify opportunities for improvement. Based on these tailored recommendations, SiteApps then enables businesses to install apps from their marketplace to help solve these problems. One of SiteApps’ customers is a family-owned home furnishings designer that was having difficulty maintaining their eCommerce presence while still focusing on the day-to-day operations of their brick and mortar retail store. Within minutes of signing up for SiteApps, they were able to identify dozens of opportunities for site optimization. By installing the apps that were recommended to them, they were able to create a compelling web presence that increased their conversion rate by 108% and led to 65% more time spent on site by its visitors. This led to a substantial increase in revenue for the business simply by unlocking the power of their web analytics data. SiteApps is free to try and takes a matter of minutes to set-up. Give it a try today to see what you can uncover from your web analytics.